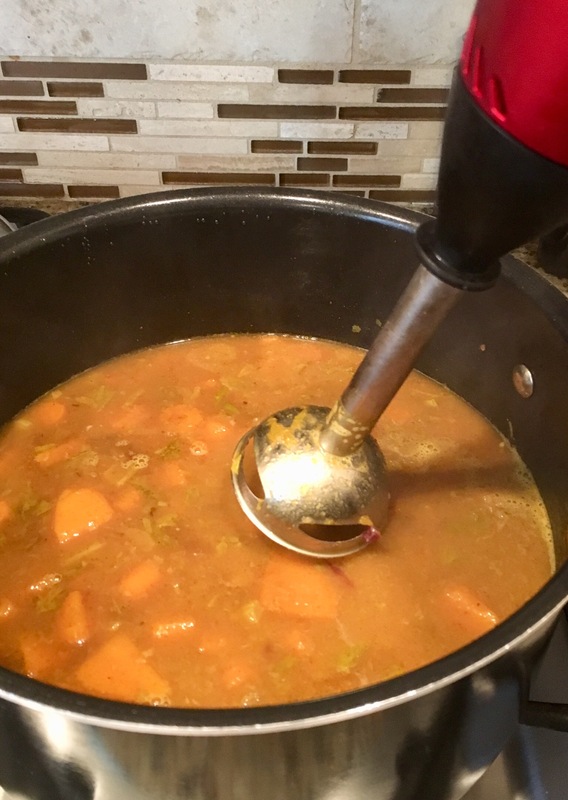 Butternut Squash – So Easy, So Tasty! – Eat, Drink, and Go! 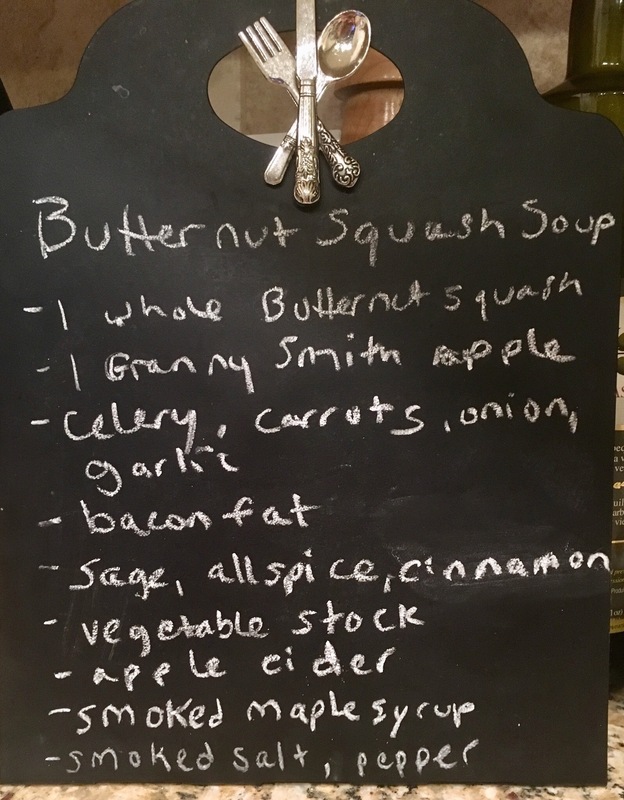 Butternut Squash – So Easy, So Tasty! 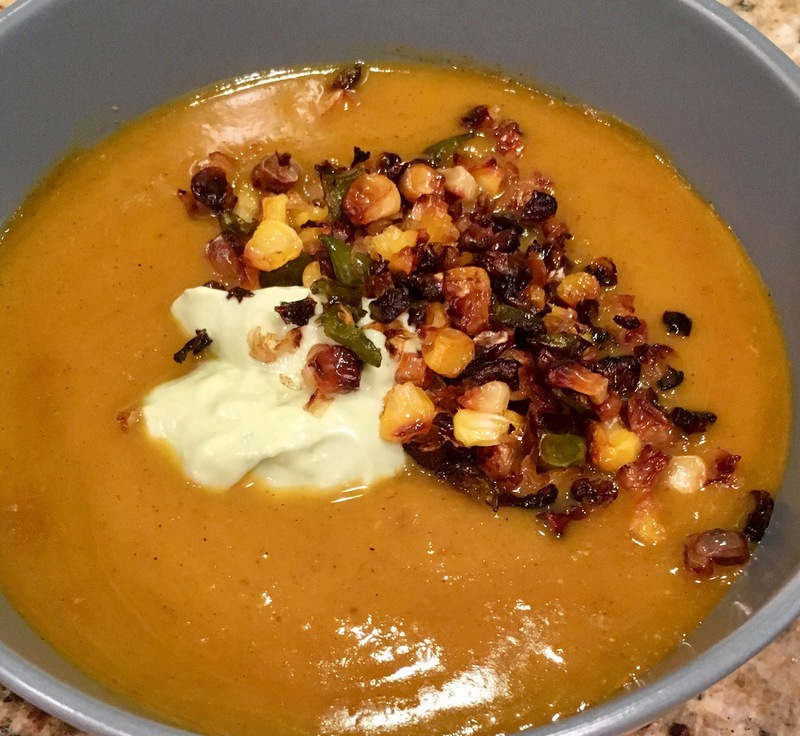 Nothing says Fall is in the kitchen air like some good soup. 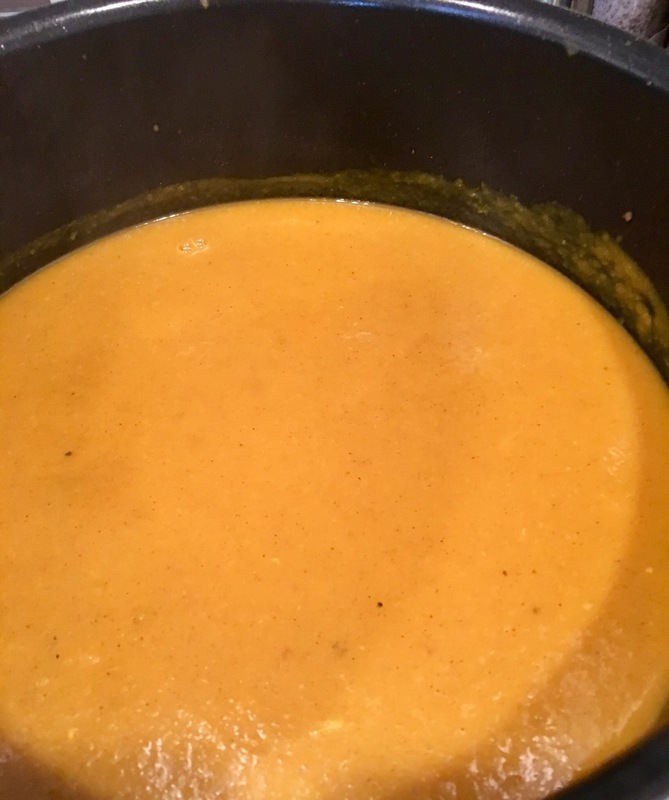 I made an easy butternut squash soup the other night, rendering plenty of leftovers to enjoy for a couple nights after. You don’t have to stick totally to this recipe, like for the seasonings, so feel free to spice it up a little. 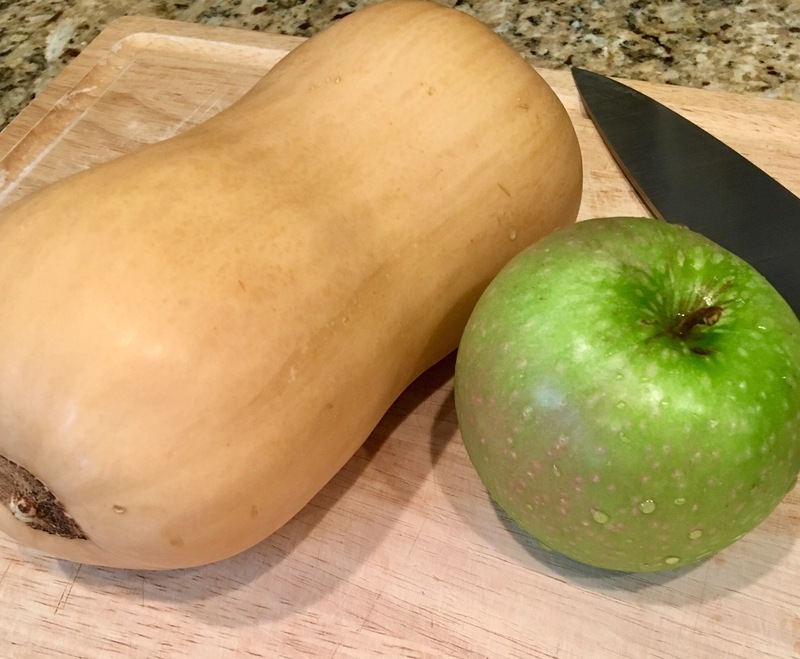 I started with a good looking butternut squash, bout a 1-1.5 pounder, and a Granny Smith apple. 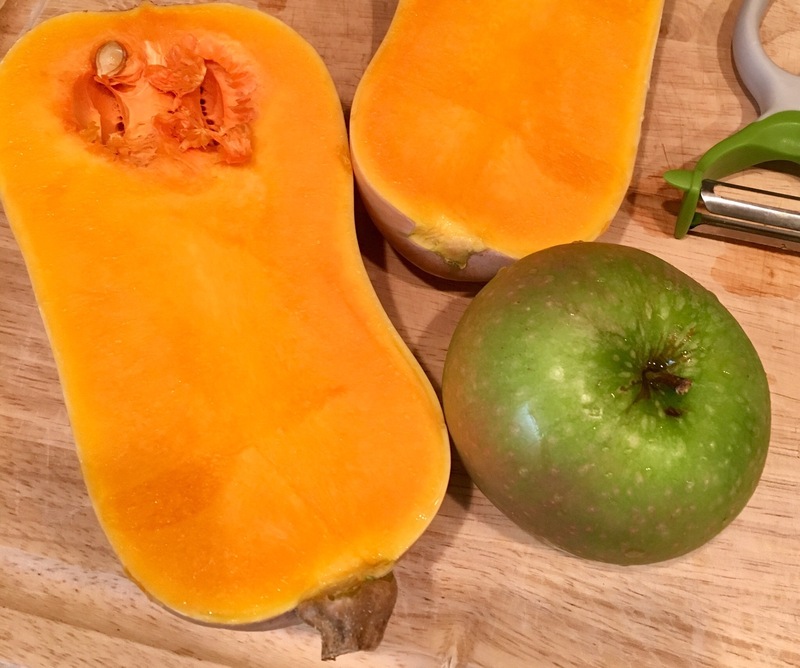 Apples and squash are so indicative of Fall, which is my favorite season. It’s been a rather warm one so far, but we’ve had a few nice and chilly mornings and evenings so it feels like it’s here. 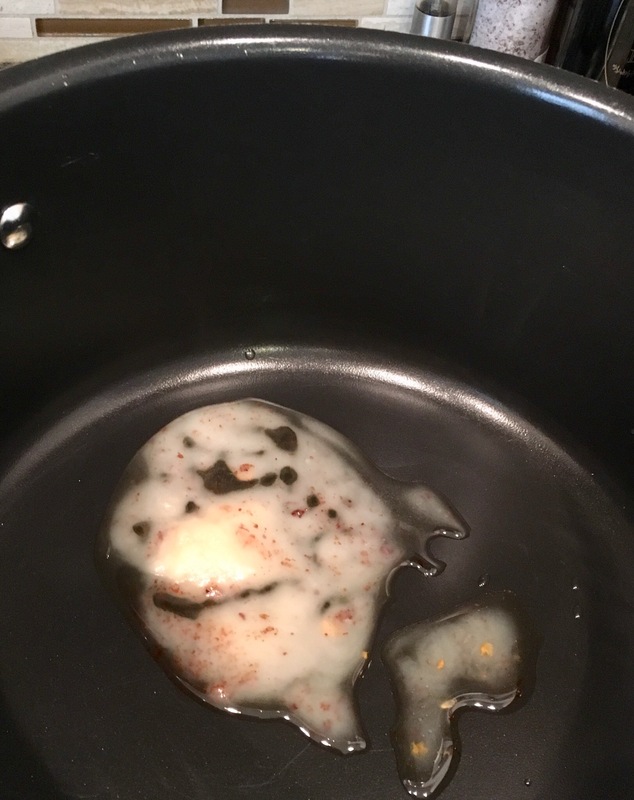 Get a soup pot on the stove and you can either cook some bacon to get a little fat base, or use bacon fat, which I happened to have. You could also keep it vegetarian and just use olive oil. 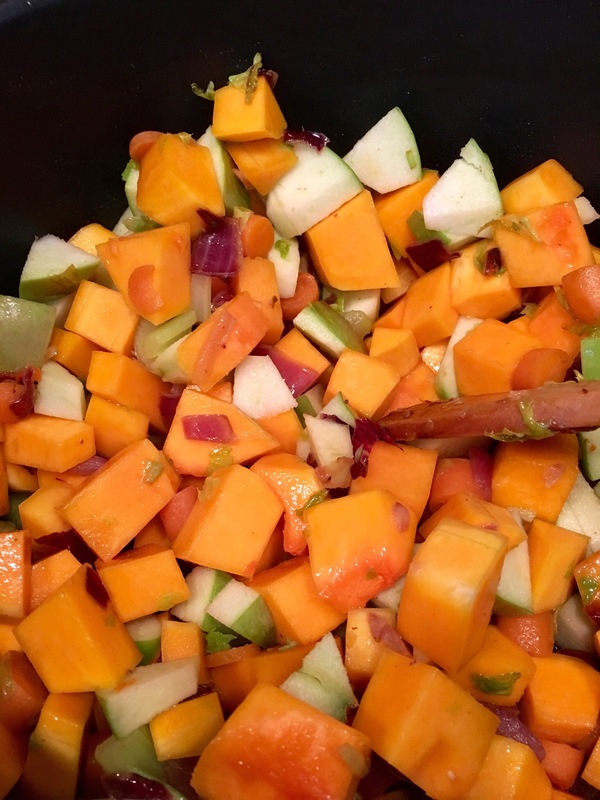 Add in some more poix – onions, carrots and celery, and sautée em up a bit. I added in some garlic too. 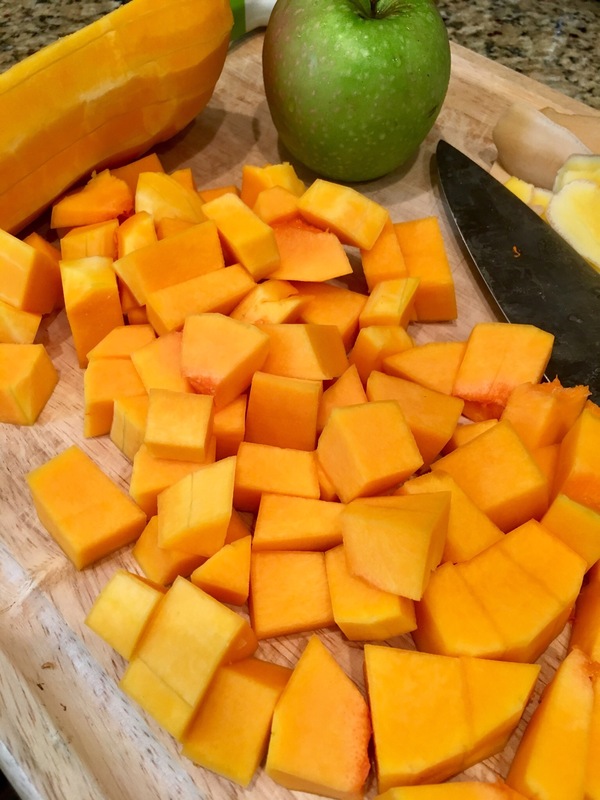 Meanwhile, peel and cut up the butternut squash into about and inch-sized cubes. 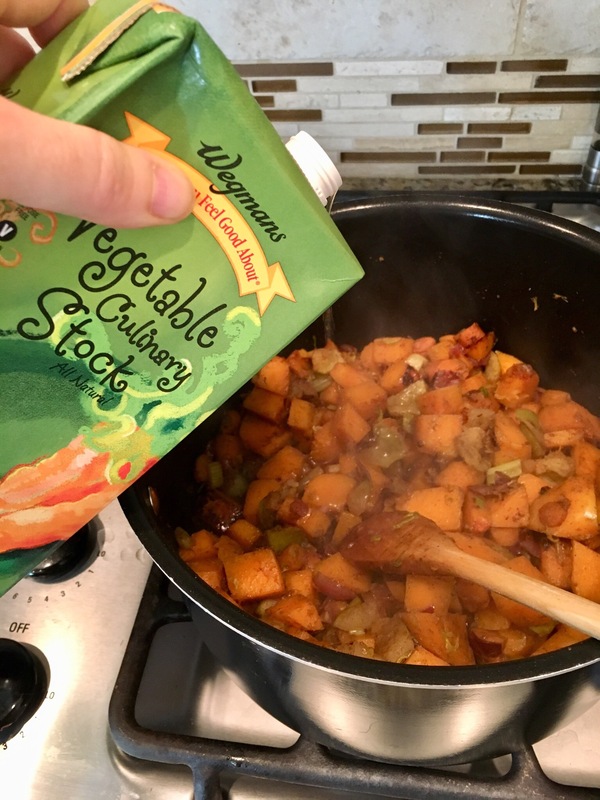 Add the cubes into the pot and keep it sautéeing so the squash starts to brown a little, core and cut up the apple and add that in too. Add in your seasonings here to start, you can always add more later. I added sage, allspice, cinnamon, and some smoked salt and pepper. Once it’s all cooked down a little, browning and sweating, add in a stock. I had a vegetable stock on hand, so I used that. I also added in about a cup of apple cider. Also something indigenous to Fall. 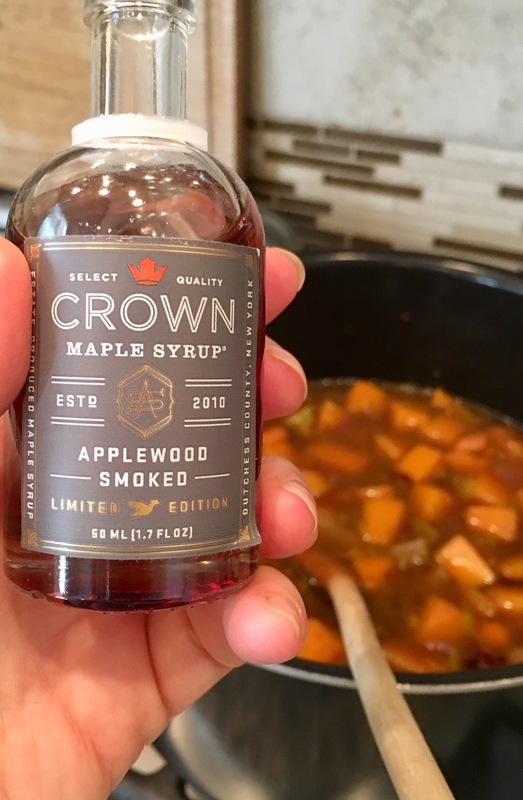 I added a touch of smoked maple syrup by Crown Maple Syrup for a hint of somethin smokey sweet. Cover and simmer for a while, like an hour or two until everything is soft and tender. Taste often and see what needs to be added. 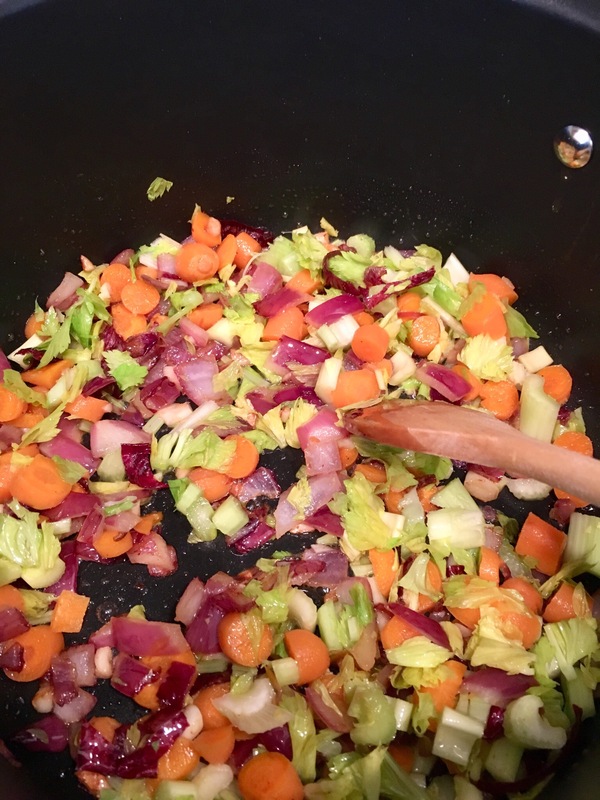 I usually add a little more salt along the way – always start light with salt because you can always add, but you can’t subtract. Hmm, sounds like me and math. Anyways, once it’s cooked, grab your trusty immersion blender. Love this thing. Blend it all up til smooooooth. I like to add toppings to my butternut squash soup. You can really do anything here. Bacon is always a good idea, in fact it was the topping for the original recipe I used the first time I made this, you just save the bacon you used to get the fat from in the beginning. Roasted crispy cauliflower is good too. But this time, I roasted up some fresh corn and a little green pepper to top, and made a little avocado cream (just avocado and sour cream) to dollop on there too. This came out mmmmmm good. 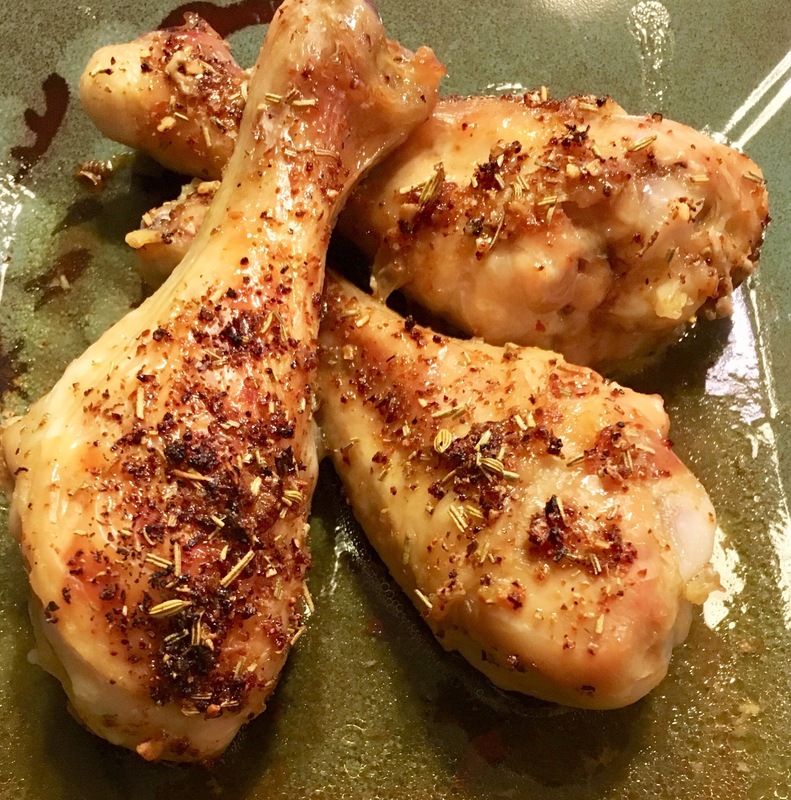 I roasted up some chicken drumsticks to go along with it. Just a simple roast with a little seasonings and a drizzle of that smoked maple syrup. A great Fall dinner! Pairs with anything! Stuffed Cabbage – More Uses for Leftovers!